These are the 2 pin connectors used with our Model 2120, 2160, 2040 USB/20 Button Pulse Generator Boards. It's nice to have some extra pieces on-hand. These are the 3 pin connectors used with our Model 2090 SUPER Rotary Encoder Board. It's nice to have some extra pieces on-hand. For those of you who wish to build their own Flight Sim panels or even circuit boards, we have acquired a number of these A-5W-K relays. These relays can be powered directly from your computer's USB's 5VDC. DPDT. 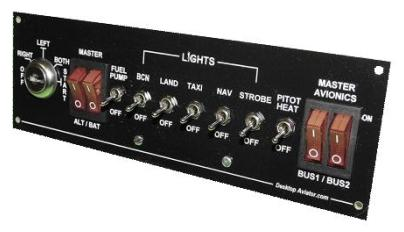 A GREAT Device for your Flight Simulator Panel or Flightdeck. PC Mount sealed automotive relay. Reduce the Footprint of the GPS/Monitor Panel. Instead of having the VGA Cable pointing Down as shown in the illustrations above, insert this Adapter to redirect the Cable to the back, thus eliminating the additional space. It's easy to use, just insert the Adapter between the VGA Input on the GPS and the VGA Cable runing from your Flight Simulator setup. You Asked for It! We Have It! 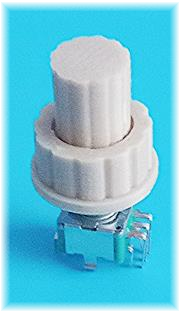 We have aquired a number of White plastic knobs for use with our 12 position Rotary Switches. 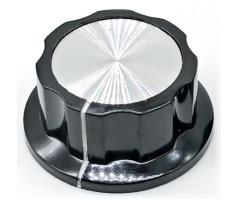 These knobs can be mounted on rotary switches with a round .25 inch shaft. A GREAT knob for your 737, 747, 777 or even Airbus Overhead panels. They measure: Length: 19mm - Diameter: 15mm - Height: 15mm. This is a 50K ohm Slide Potentiometer with a Linear Taper output. 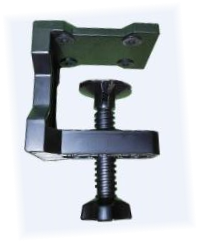 This item is used extensively with homemade Flight Simulator Panels as Push Pull Throttle Quadrants. 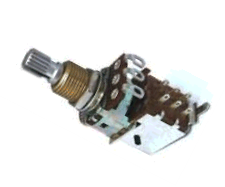 This is a 100K ohm Rotary Potentiometer with a Linear Taper output just as the pot seen above except is has a 1.32 inch long 1/4in diameter shaft. Just perfect for building your own Elevator Trim Wheel. Easily connects to our 2090/2095A Rotary Encoder Boards. Here we have a 15 ft USB Cable, Type A Male to Type A Female Extension Cable. Time to stock-up on these very useful extension cables. Sometimes a 6 ft cable just does not cut-it. You need something longer. Standard Single Pole Double Throw Toggle Switches, Mounts in a 1/2” hole with Solder tabs. Rated 4 Amps @ 125VAC. Can be used with our Model 2160 Pulse Generator. Here we have a SPST Toggle Switch w/GREEN Top. These switches fit in a round cutout measuring 0.75in.and are 1.60in long. They also have a 12VDC internal bulb. Measures: 15.79mm high by 12.70mm wide for 6.35mm round shaft (.25in). our Rotary Switches. Comes with set-screw. This Adapter will allow easy connection of your 2050 GPS w/Monitor (or any other VGA monitor) to your Multi-Output Video Card. Not to be confused with a DVI; this DVI-I has the additional 2 pins above and 2 pins below a short metal tap. Introducing our NEW Model 2770 Digital/Analog Interface. An easy and inexpensive way to interface up to Eight Analog input devices such a Rotary and Slide Potentiometers at 12 bit Resolution as well as Six SPDT Toggle Switches or Twelve Spring Return Push Buttons (or any combination of both). And the Cessna Throttle Assemblies seen above. A GREAT switch to make your own Parking Brake, a Fuel Emergency Cutoff or even a Fire Extinguisher for thoses annoying but occassional engine fires. These are very high quality Single-pole-double-throw mini-toggle switches (SPDT). They are compatible with all DTA circuit boards. Yellow Defused. 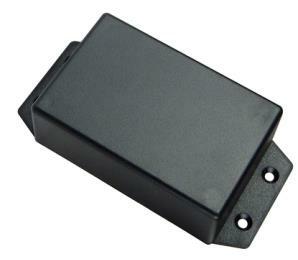 External 1/2W resistor needed (330 ohms supplied). Standard USB Cables for use with all of DTA's Circuit Boards and Panels. Series "A" male connector on one end and a Series "B" male on the other. Light Gray" in color. Brand New Dual Concentric Encoder w/internal Normally Open switch. This encoder is used on radio panels or anywhere you need 2 encoders in a small area. Great for Flight Simulation applications! Use these NEW Plastic Faceplates to mount your Push Buttons, Toggle, Rocker Switches when designing and wiring your own Panel. This Attractive Panel is made of durable Black Plastic that measures 7.75 inches by 2.32 inches. The Panel is Textured on the front, with a flat finish on its back. Just Drill the required hold size mount your Switches or even the Push-Pull Cessna Slide Assemblies to build your own Throttle Quadrant. All faceplates are NEW without Holes. For thoses who purchases our Model 2395 Fuel Tank Select Panel, we have designed a replacement for the Silver Knob attached to the Fuel Cut-off Push-Pull Switch. For the added realism of having a RED knob indicating an emergency switch, all you need to do is to unscrew the Silver knob and replace it with the RED. An easy upgrade for a more realistic panel. It measures: 25mm by 8mm. The perfect and the most inexpensive way to keep track of the USB voltage levels. This Digital (RED LED) Voltage Meter measures DV voltages from 4.5 to 30VDC. A YouTube video from one of our customers, Peter B. in Virgina, showing his Flight Sim panel using our Model 2625 Cessna Switch Panel, the Model 2535 FLAPs Controller and our Model 2695 Landing Gear Panel. Here is a nifty add-on to your flight deck; a Parking Brake "T" Handle. It measures 2.1 inches long by 0.6 inches wide and 1.1 inches deep. 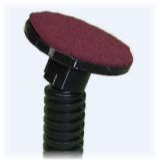 This handle can be forced mounted on any push/pull switch with a .25 inch diameter shaft. Build your own Brake Assembly. This is a 100K ohm Rotary Potentiometer with a Linear Taper output. This item is used extensively with homemade Flight Simulator Panels. 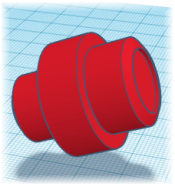 New to the DTA lineup of Flight Sim Add-ons, we have a 3D Printed Thumb wheel Assembly. 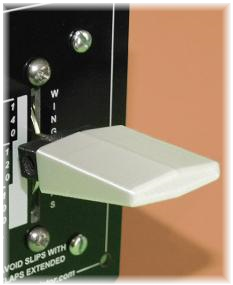 When used with our Model 2770 D/A Interface (Analog Input), the Thumb Wheel can be configured as a Rudder, Aileron or even an Elevator Trim Wheel. Comes with 3D Printed Wheel (White), 2 mounting Brackets, 3-pin Extension Cable & a 100K Ohm Long Shaft Potentiometer. Need an easier way to connect your Toggle or Push Buttons to our Interface boards? Well, here are 14 inch 2-pin Extension Cables. Just solder the switch to the wire leads and plug in the connector to the Interface board. Come check-out our NEW Cessna Style Elevator Trim Wheel. The ultimate in flight simulator Realism.